Reproduction of a famous world map by Muhammad al-Idrisi. This map isn't part of any series, but we have other historical maps that you might want to check out. 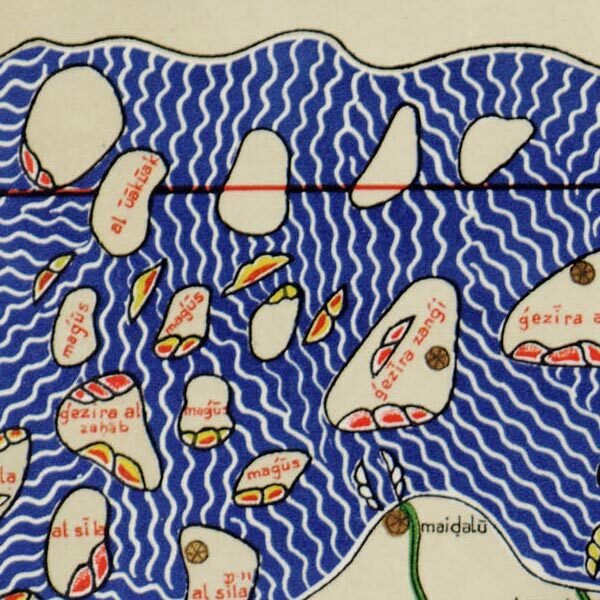 This is Konrad Miller's 1929 recreation of Muhammad al-Idrisi's famous Tabula Rogeriana from 1154. I'd love to post the original, but I've not yet found it at sufficient size. Until then, this will have to do. If you've stared at it a while and are still struggling to spot familiar landforms, try standing on your head. Al-Idrisi is a hero of mine (and to many other geographers) and he's well worth reading about. His influence on cartography is quite hard to overstate. It was in his honor that programmers at Clark University named their GIS program. Does anybody know where the original map written in Arabic script is in custody? Does anyone know where the original of the Tabula Rogeriana remains, can it be seen in a museum somewhere in this world? This reminds me a little bit of Peutingeriana – the scan on Wikipedia is not quite as good as it should be!